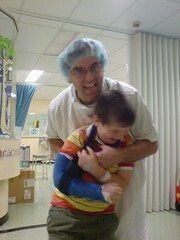 Harrison had his op today. 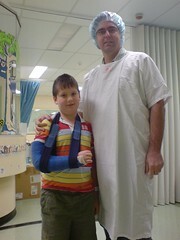 They let me go into the operating theatre with him to stay with him while he got his anaesthetic. It’s a pretty harrowing experience to watch, so it must have been quite scarey for the young fellow. He was brave. I asked him if he was scared and he said “No”. I said it was ok to be scared, then he admited that he was a bit fearful. It went well. The doc says they didn’t need to take any cells from his pelvis. They got some from the other bone in his forearm (ulna). The damged bone (radius) is wired together again now, and will start on the the Pamindronate therapy in a couple of weeks. Liz is staying in the ward with him this evening. Hopefully they’ll be out tomorrow.